Garcia Trujillo helps Fortune 500 and multi-national management teams to significantly grow their market share in the Hispanic market, focusing on strategy, execution, operations and organization. 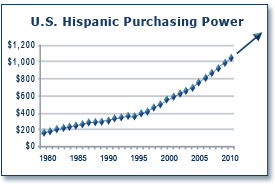 Our merchant bank works with Hispanic owned companies and companies seeking to expand their presence in the Hispanic market. We connect them to non-traditional sources of capital in Latin America, and our Founding Members and our private equity fund may also invest in their businesses. all but 9 countries in the world. Insider Game is a new film that takes a unique look at the lack of Hispanic inclusion in Corporate America. Garcia and Trujillo are among the prominent corporate leaders offering insight. Great organizations thrive with extraordinary leaders. Garcia Trujillo’s latest book offers powerful leadership tools to transform your business into a world class company.